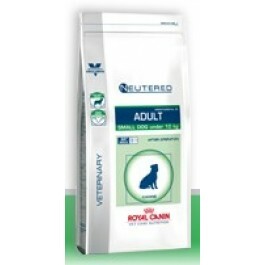 Royal Canin Veterinary Care Nutrition ranges are precisely formulated for specific needs. Please speak to your vet about these products. Neutered Adult is a complete feed for small breed dogs (under 10kg) with a tendency to gain weight or oral sensitivity. Suitable for dogs over 10 months old. Ingredients: Barley, maize, dehydrated pork protein, dehydrated poultry protein, wheat flour, vegetable fibres, wheat gluten*, hydrolysed animal proteins, animal fats, minerals, chicory pulp, soya oil, fish oil, psyllium husks and seeds, fructo-oligo-saccharides, marigold extract (source of lutein). Nutritional Additives (per kg):Nutritional additives: Vitamin A: 24900 IU, Vitamin D3: 800 IU, E1 (Iron): 41 mg, E2 (Iodine): 2.8 mg, E4 (Copper): 10 mg, E5 (Manganese): 54 mg, E6 (Zinc): 203 mg, E8 (Selenium): 0.1 mg - Technological additives: Pentasodium triphosphate: 3.5 g - Preservatives - Antioxidants. Analysis:Protein: 30% - Fat content: 11% - Crude ash: 6.9% - Crude fibres: 6.5%.